Have you ever had calligraphy practice come out of nowhere and fall into your lap? That's what happened to me recently. With the new Baron and Baroness, Augustin and Aleit, came renewed inspiration for calligraphy and illumination. 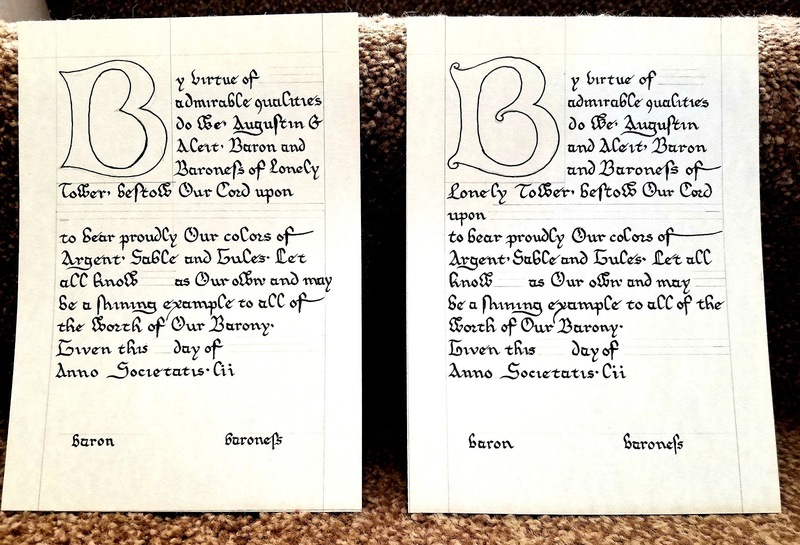 Their wish was to have a small 5" x 7" hand done scroll to go with the first award a person new to the Barony received. Her Excellency Aleit composed the text and M. Rolf developed the two script styles. One used for Augustine's 12th Century persona, the other for the 15th century Burgundian, Aleit. Rolf also kindly figured the pen nib and grid size to use. Manuscript cartridge pen fine nib on a 9 squares to the inch grid. They would be done on natural Astroparche 65 pound card-stock. The first thing I did was buy a ream of the paper. A bit pricey for more paper than I needed, but I thought it would eventually be used by other scribes in a preprint or small original scroll. Later I was glad I did. I also went to the Incomptech's online graph-paper creator and made Rolf's prescribed graph. I printed this off on clear injet-friendly transperancy film to use with my light pad. This may seem pricey, but I know how much layout time it will save. 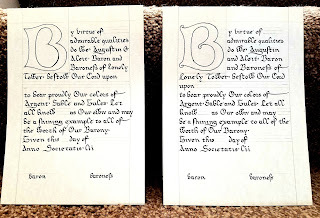 These scrolls turned out well as you see in the picture before they were painted. What you don't see are the 20 some double-scroll pages I did to get to this point. I learned original calligraphy on card-stock is difficult to correct. Manuscript cartridge ink sinks into the paper's surface; scratching it off roughens the surface beyond use. A useful thing to know for the future, however frustrating. The multiple unsuccessful pages were boons for my calligraphy. And I'm now familiar with M. Rolf's scripts. The unexpected calligraphy practice falling into my lap was a windfall. You don't know how much you will improve until you do the practice.